Phoenix misting systems specialist, Pro Outdoor Services, designs and installs residential and commercial high-pressure misting systems throughout the Central and Northeast Valley in Phoenix, Scottsdale, Cave Creek, Carefree, Fountain Hills, and Paradise Valley. Misting systems, commonly known as mist systems or misters, are a great way to enhance any outdoor space and make it usable during the hot summer months in Arizona. High-pressure misting systems are designed to create a fine mist to keep an outdoor area cool, without giving a damp or wet feeling that is often associated with low grade misting systems. Phoenix misting systems installed by Pro Outdoor Services are designed for all types of outdoor areas. The most common areas for mister systems are for patios, pools, restaurants, barns, and play areas. Along with misting systems, Pro Outdoor Services also install fog systems and fog effects, which are a great way to cool off other outdoor areas that may not need a full mister system. Fog systems and fog effects can be used for pools, outdoor sitting areas, grilling areas, and not only aid in cooling, but also offer visual effects that can be enhanced with lighting to create colored fog and more. Fog effects can be subtle or dramatic, and create a cooling effect in any outdoor space. Phoenix misting systems, installed by the professionals at Pro Outdoor Services, offer many enjoyable benefits. The best benefit and the main reason for installing a misting system is the drop in temperature that it can create for an outdoor space. Mist systems typically drop the temperature of an area by 20 to 30 degrees, which makes the area enjoyable to sit in during hot summer months, giving you year round enjoyment of being outside. Not only that, mist systems, fog systems, and fog effects help with dust elimination and bugs. They make outdoor activities doable in the hot summer months that otherwise wouldn’t be possible. Pool time, relation, and outdoor dining can all be enjoyed during the hot summer months with the installation of a misting system. 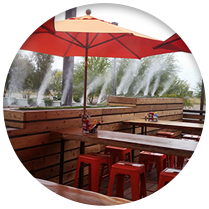 Phoenix misting system installer, Pro Outdoor Services, installs professional grade, high-quality misting systems for patios, pools, restaurants, playgrounds, animal enclosures and other applications. Our focus is constructing high end misting systems using quality materials and experienced technicians. All of our systems are priced and installed to give our clients a high-quality misting system that will last for many years to come. The mister systems installed by our highly-trained crews are constructed with a high-pressure misting pump along with stainless steel or copper piping and anti-drip nozzles so that you can rely on your mist system for year round enjoyment. Also available are remote control setups for ease of use with your misting system. Contact our Phoenix misting systems experts today to learn more about the high quality, professional grade misting systems custom designed and installed by Pro Outdoor Services. Our highly trained team installs misting systems is Phoenix, Scottsdale, Paradise Valley, Cave Creek, Carefree, and Fountain Hills.